I was looking through the google analytics stats for my sites and noticed something very peculiar. Someone ended up on my main site by searching for "digital picture frames on shabbos". What I really want to know is the reason someone might search for this. Did some frummy decide that for some insane reason picture frames might be a problem on shabbos? Why would it be a problem? I can't even come up with a bad excuse, forget about a good one. Air conditioner is not a problem, neither is the crock pot or water urn. So what's wrong with a digital frame? I have a digital frame which I turn on specifically for shabbos. Once I started using a digital camera, I don't make prints anymore. After everyone's been complaining on and on about no pictures of my son from the day he was born, I decided that a digital picture frame is cheaper and more innovative than printing pictures. After I bought the frame, I bought frames for our parents so they would also get off my back and stop asking me to print pictures for them. A digital picture frame is a great gadget to have. Buy one, at least 7", loaded with pictures and place it within view of your shabbos table! I get a call Saturday night at 10:45PM, that's almost 90 minutes after shabbat was over. It's a woman from shul and someone told her that I know something about tomorrow's BBQ. What BBQ? Now this woman has called after 10 before and I told her that she's not to call even after 9 and if she wants to reach me or my wife, we both have cell phones and email. I tell her that I don't know anything about any BBQ and why is she calling me at 11 when she knows I have a 2 year old kid and when I specifically told her last time not to call after 9. She has the nerve to tell me that it's not actually 11, it's 10:45. I was pissed off when I picked up the phone, now I'm pissed off more. It's been 90 minutes since shabbat was over, why is she calling now? Why is she calling at all about something that will be tomorrow night and no I don't know any details. So she gets all defensive and is like "well, I made a mistake but you shouldn't talk to me that way." FU, if you're stupid and inconsiderate and do things without thinking, I'll talk to you however I want to make sure you never call here again. There's a shirt I'm always planning on buying and never manage to, maybe next time there's a sale. On the shirt it's written, "I'll be nicer if you'll be smarter." Here's a quick, fun recipe for making your own lox. You'll need fresh salmon, make sure it looks nice and red and not spoiled when you buy it. Kosher salt and sugar for salting and for spices, I'm currently using dill and dry mint. Remove skin from the salmon pieces. Mix together 3 parts salt and 1 part sugar and sprinkle on both sides making sure there's a nice even layer. Very sparsely sprinkle dill on both sides. For each side, crumble 1 dry mint leaf with your fingers and sprinkle on top of the dill. Cover with another plate and refrigerate for 24 hours. Check the salmon occasionally and remove any liquid from the plate. 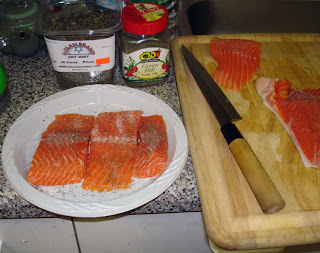 To make the cure salmon resemble lox, place a 1lb metal can, for example, of tomato sauce, on top. The sugar to salt ratio can be varied as long as there's at least 2 parts salt to 1 part sugar. For flavoring you can also use parsley, crushed black pepper or any other spices you like. In the end he also says "hi" and laughs. There's an urban legend that most people dream in black and white. Why an urban legend? Because everyone I asked said they dream in color. I'm pretty sure that all my dreams are in color and I don't recall ever dreaming in black and white. Supposedly, you would be unable to read in your dreams and the letters would appear as gibberish. I don't remember seeing books or newspapers in my dreams, but I do remember signs with numbers and letters and they were quiet legible. One weird thing about my dreams is how I fly. I once dreamed I was able to fly by flapping my ears. No, this was not after watching Dumbo and it was actually very difficult to do. My usual way of taking to the skies is gliding like a ninja. I would jump up and kinda glide forward and downwards as if I had a glider attached to my back. Ironically, these dreams were before I watched Crouching Tiger, Hidden Dragon and Naruto. My new pet project, the discussion is here. My dad recently told me about a virus called Invitation. The worst virus ever that destroys your computer. When he told me that he heard about it on Davidzon Radio (Russian radio), I told him it's bs since Russian radio will repeat anything from anywhere without actually bothering to check the facts. He was quiet upset by that so I decided to prove him wrong. Originally, he didn't remember the name of the virus. I went to Symantec's viruses and risks page. Nothing there above level 2. He still didn't believe me, apparently Russian radio is more informed about viruses than Symantec. This week I finally got the name of the virus out of him. He also said that they mentioned that CNN is calling this the worst virus. CNN knows one virus from another? Anyway, off to snopes I go and guess what, it's there and so is the CNN quote. This "virus alert" was issued by Boris Talis. I assume he received an email, read it, and like all the other retarded little sheep forwarded it to all his friends and warned his listeners on the radio too. Not one of these starfish, no brain and too many hands, ever checks the facts. Reads the email, screams "OMG!" and feverishly forwards to all of it's friends and acquaintances. Half of these hoaxes aren't even believable. And even if the starfish doesn't know about snopes, there's google and educated friends that it can ask. They never do. And it gets worse when one of those things works on the radio. I never learn. I'm allergic to cats and dogs. I also love cats and dogs and will play with them even though I'll be sneezing and itching afterwards. I'm also allergic to food by brisim. I can eat cereal with milk at home. I can eat cheese, eggs, fish, coffee, I even eat raw fish and home made cured salmon and yet almost every time I go to a bris, I get indigestion. It can be bad or mild but it's almost always there. What I can't figure out is is it something in particular or is it a combination of things. Today we had a bris in shul and as always I set down to eat. Yep, I never learn. And again I left the shul feeling bleh. I had karate right after the bris. I didn't want to skip, however I made sure not to bring the sparring gear and to come late enough to miss the warm up. It wasn't too bad though I was spacing out and messed up the kata. Will I eat by a bris next time? I sure will. The week before Pesach I was in Mountain Fruit. I bought Ora's Organics Herbal Tea. These were new teas and for some reason weren't in the computer. The cashier turned around and asked the cashier behind her for the price and was told it was $2.49, the price for Wissotzky tea. I told her that's the wrong price and that the price is $2.19, she changed. Fast forward to today. The same exact scene was played and I think it was even the same cashier. The teas are still not in the computer and just like last time she turned around and asked for the price and was told it's $2.49. This has happened to me in Mountain Fruit way too many times. The sales prices are not in the computer, not on the day the sale starts and not on the second day either even though the prices are posted above the products. The cashiers pretend not to know the sales prices even if the sale has already been going on for a week. On one occasion, the cashier refused to go check or change the price. There was a sale on chocolate around Purim and I took a couple different ones. Not only did some of them scan in under the wrong name but also the wrong price. I told the cashier that they were on sale and she actually had the nerve to start arguing with me that some are and some are not. I told her that the sign above them said all of them were on sale. She refused to go check and told me I'll have to speak to the manager. I said ok. She continued sitting there looking at me and waiting for me to pay. I told her to call the manager because I will not pay and not leave. The manager told her to change the price. Later that week I went to buy some more of that chocolate. It was still in the same location, same flavors and same sign above them and again they scanned in under the wrong price. Is this due to negligence or is it being done on purpose? I don't know. However, considering how frequently this happens, you gotta wonder. Recently I bought a new frying pan from Amazon. Today I finally went to toivel it and decided to use it to cook dinner. I made stir-fry with BBQ sauce. The frying pan is hard-anodized aluminum and this thing rocks! Cooking and cleaning is a pleasure. One thing I like about it is that instead of one long handle it has 2 steel ones, comes with a lid and is oven-safe up to 450 degrees! You can start cooking on the stove and move the whole thing into the oven, or the other way around. I seriously recommend this to anyone who likes stir-frying. Just had a conversation with one of my psycho frummy bal tshuva friends. This guy goes to feel good lectures and listens to tapes, however, when it comes to learning halacha, looks like it's too boring for him. This is actually the same conversation, about the same topic and the same store I had with him last year. He wanted to get something to eat and asked me if I know of any places that are still open. I told him he can get sushi on avenue M or if not too lazy, drive to Shoprite. Shoprite is, I'm pretty sure, owned by a Jew and sells sushi under a good hashgocha. He tells me that he's not sure if the owner sold the chometz properly so you can't buy sushi there. What?! I tell him that, one, there's a good hashgocha there and two, sushi is not chometz, though soy sauce is. His reply is that the hashgocha is only there for the cooking and you can't trust them to make sure that the store sold chometz properly and that you can't buy sushi because chometz might not have been sold properly. No point arguing with this guy since he's not much interested in learning halacha, he loves chumras though, so I just left. Last year he said he wants to ask a Rabbi, same thing he said this year and same thing he'll say next year. There are plenty of books and online sources for halacha. If you want to know, you can find out or you ask a rabbi or go to a shiur. What infuriates me is that these people don't know halacha, gonna argue with you because you're not a rabbi and apparently know nothing because of that and they're not gonna bother asking or finding out themselves. One happy thought is that for them, ignorance is not bliss. Out of their own stupidity and stubbornness they're going to make their own lives worse. Before the fun at the first seder, read the post below, we had some fun at home. On shabbat, in our dining room, the light bulb decided to suddenly burn out. I live in the basement and have an air conditioner blocking most of the window so even in the middle of the day having no light is a problem. We use oil and it was still burning during the second meal so we had some light. For the first seder we went to shul, the second seder, however, was going to be a problem. Around half a year ago, one of the bulbs for the oil got broken. I tried looking in all of the seforim stores in the neighborhood but they were only selling tiny bulbs and the big ones that we use were only available a month before Chanuka. In one store, I was recommended to use the cup for neriot. Now these things are small, ugly and way too thick, so no way. I looked around the house and lo and behold, the solution was standing among my wine and liquor glasses. For Fathers Day, my wife got me two shot glasses with the word dad on them. The shot glasses were a decent size, square and the word dad was in pewter on one side. This was perfect! Until Chanukah I was using a real man's candlestick. On Pesach, those very useful Fathers Day's presents were put away. Luckily, I had three shot glasses that my mother-in-law brought from Florida that I never managed to toivel and they were never used and were standing in the bookshelf in my son's room. They were round and painted but what can you do. The second meal of first day was spent in front of six candles. For the second seder, I needed a havdolah candle. One shot glass plus oil, plus two wicks, equals one havdolah! We also found seven wax candles and used three at a time for having more light for reading of the haggadah. A can from from palm hearts, turned upside down, was used as a candle holder. We have two nice, silver candle holders and a glass one. Personally, I prefer the shot glasses to the silver. Not only do they take up a lot less space, but they are truly unique. I'm thinking of getting another square shot glass, preferably same size and style as the ones I have, putting away the silver and always using these man's candlesticks.